AmericanLandlord.com, a service of the AmerUSA Corporation (“AmericanLandlord.com”), allows us to collect your personal information for comments and forum posts such as name, email address and IP address. NOTE: We strongly advise against posting any personally identifiable information when commenting on public articles or forums. While AmericanLandlord.com collects minimal user data (typically only when provided regarding comments or forum posts) AmericanLandlord.com takes precautions to secure your personal information and has controls in place to limit access to and secure the data maintained on our servers. If you indicate to us that you are interested in receiving information regarding other products and services your name and e-mail address may be shared with a third party in order to present these offers to you. Personal information that is shared with these entities will be monitored in accordance with our security and confidentiality policies. If you prefer not to receive such information, you may indicate your preference by marking the appropriate box when you register, place an order or update your account information, and AmericanLandlord.com will not send you any promotional materials. If you indicated to us when you registered, placed an order or updated your account that you were interested in receiving information about products and services provided by AmericanLandlord.com, your name and email address may be shared with a third party in order to present these offers to you. These entities are only allowed to use shared information for the intended purpose only and will be monitored in accordance with our security and confidentiality policies. 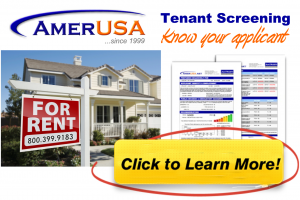 In the event you indicate that you want to receive offers from AmericanLandlord.com, your information may be used to serve relevant ads to you when you visit the site. AmericanLandlord.com also may disclose your personal information to third parties in the good faith belief that such action is necessary in order to comply with, or be responsive to, legal process served on us (such as a subpoena), or if we believe such disclosure is necessary to protect and defend the rights, property or safety of AmericanLandlord.com, our users or others. In addition, we may disclose your personal information to consultants, agents and advisors, such as attorneys and accountants, in the good faith belief that such disclosure is within the scope of their professional duties to AmericanLandlord.com and with the understanding that such professionals will abide by our security and confidentiality policies. In order to enhance the usefulness of our Web site and our products and services, AmericanLandlord.com will collect data about our customers’ use of our Web site, in a manner that does not include any personally identifiable information. While you browse the AmericanLandlord.com Web site, we note which pages of our site you visit and note the IP address of your computer (as all Web sites do automatically), but we do not link that address information to your personal information. The general information we gather enables us to serve our customers better by continually enhancing our site based on up-to-date use patterns. We may use third-party advertising companies to serve ads on our site or on other sites which we use for advertising. These companies may employ cookies and action tags (also known as single pixel gifs or web beacons) to measure advertising effectiveness; and they are not authorized to use the information we share with them for any other purpose. Any information that these third parties collect via cookies and action tags is completely anonymous. We define children as individuals under the age of 18. Our Web Site is not intended for the use of children and we do not intend to collect information about children through our Web Site. You must be at least 18 to use this website.